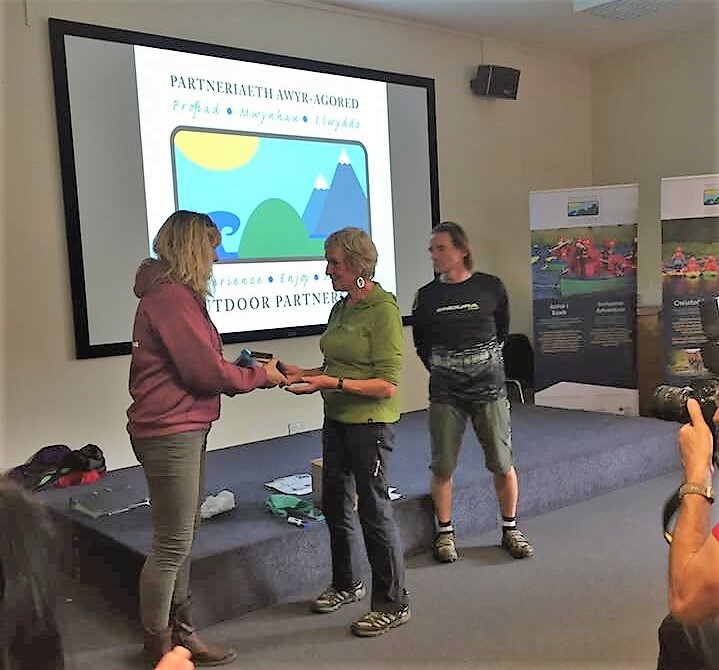 Trefriw Walking Festival is now in its seventh year, and continues to grow annually, such that it is Snowdonia’s most popular Walking Festival. The event was started in 2013 by Gill Scheltinga (who is still our Chairperson), when just 8 walks were offered, and for the first two years the Festival was run as an event under the auspices of Cerdded Conwy Walks. 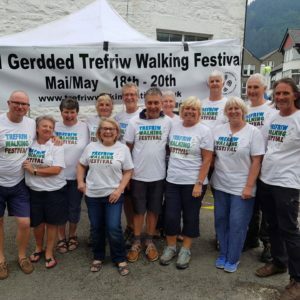 Since 2015 the three-day Walking Festival has been organised and run independently by a Walking Festival committee; all of the members live in Trefriw itself. In addition to devising walks and recruiting additional walk leaders and other helpers (though many walk leaders are also committee members), this enthusiastic team of volunteers does everything from marketing and publicity, taking bookings, fund-raising and maintaining the bi-lingual website, to dealing with insurance and undertaking risk assessments, etc. 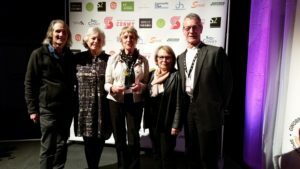 We were thrilled in Autumn 2014 when Trefriw was awarded Walkers are Welcome accreditation – an accolade given to towns and villages “with something special to offer walkers”. 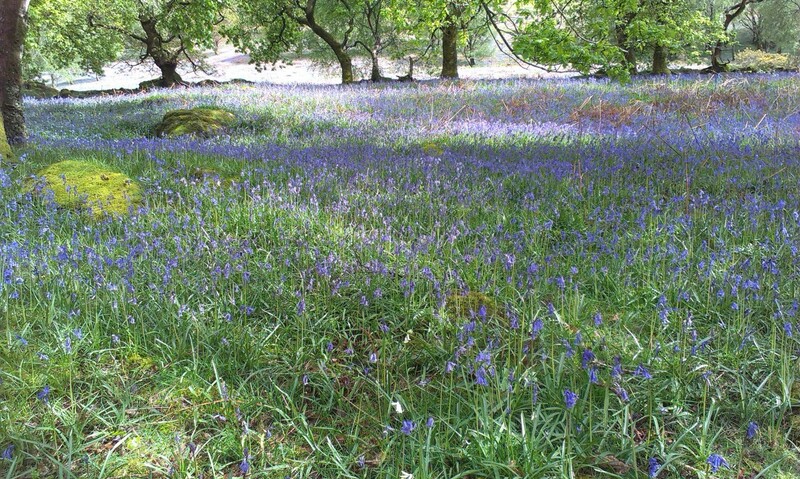 (Trefriw is the only village in the Snowdonia National Park to have such status.) Every year we have to apply to retain this status, so it keeps us on our toes! 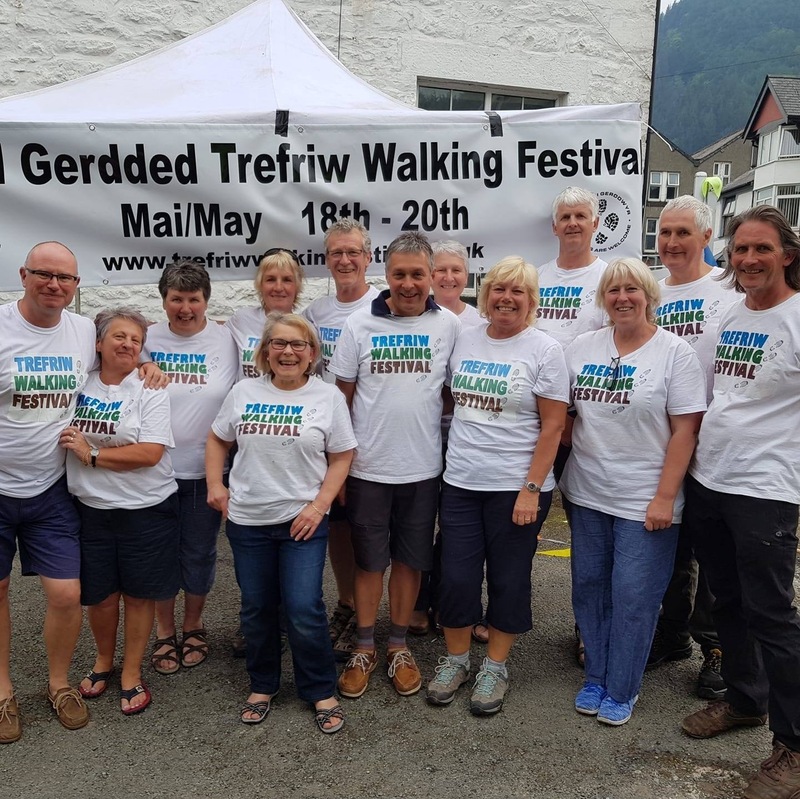 The Walking Festival Committee embraced this status, such that Trefriw Walking Festival is now officially an event run under the banner of Walkers are Welcome, and it remains the main event in our year. We are often told by our regular attendees that the walking festival just keeps getting better year on year, and in June 2018 Gill Scheltinga, our Chairperson and founder, was awarded the accolade of ‘Volunteer of the Month‘ by the Outdoor Partnership. You can read more about the award on their website. 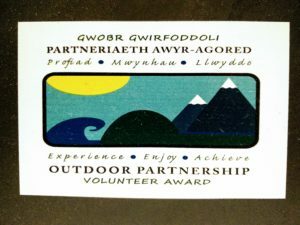 Then in September 2018 it got even better when, at their annual awards, Gill was named as the Outdoor Partnership’s ‘Volunteer of the Year‘. 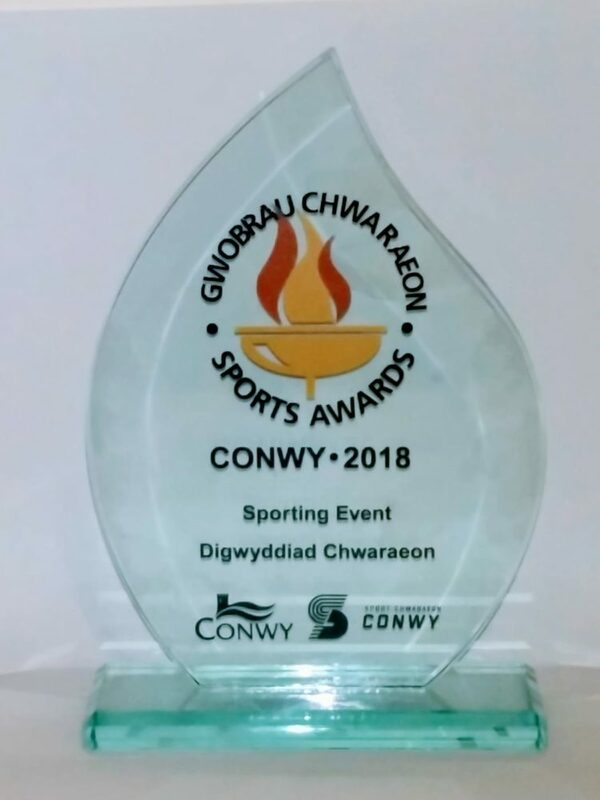 We are always appreciative of the good feedback we receive, but in November 2018 we were surprised and honoured to be voted ‘Event of the Year, 2018’ at Conwy County Sports Awards, held at Venue Cymru, Llandudno. 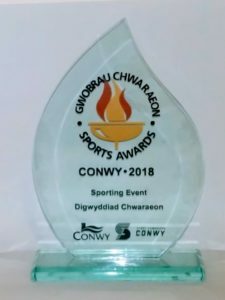 This particular award was sponsored by Sport.Wales’ Community Chest, a grant from whom had enabled us to train more walk leaders (especially in first aid), to obtain more first aid kits, and to purchase some equipment to make our event more inclusive. (below) Five of our team – Tony, Cate, Gill, Kim and Idris – accepted the award on behalf of the whole team. 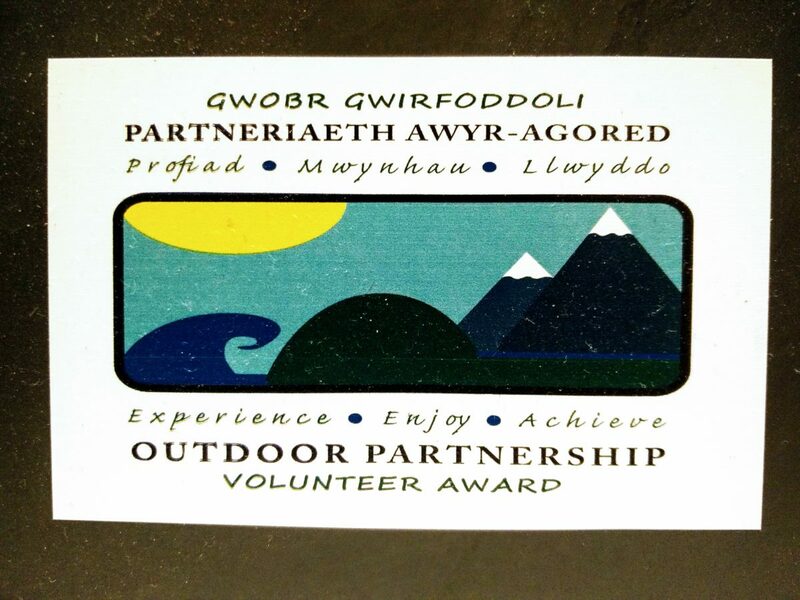 (below) The trophy for ‘Sporting Event of the Year, 2018’, awarded to Trefriw Walking Festival. 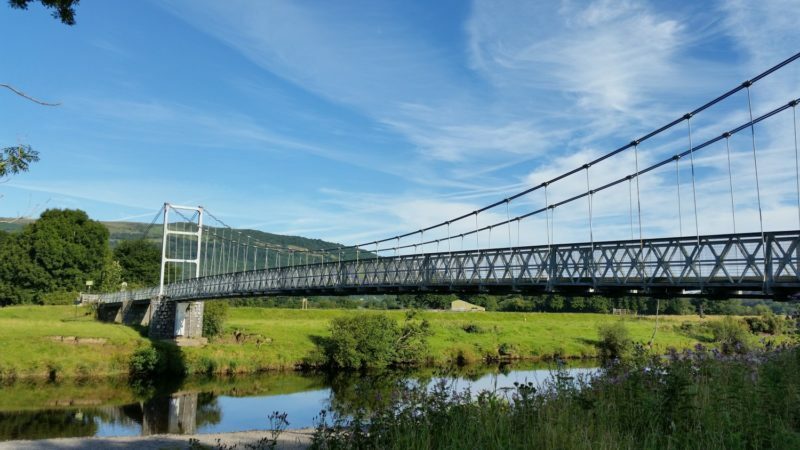 Trefriw Walking Festival is a non-profit making venture. However, running such an event incurs considerable costs, and our main fund-raising activities are held in conjunction with the Walking Festival itself, namely the Grand Draw and the Cake Fest. Together with donations from walkers, our aim annually is to raise enough money to ensure the future of the following year’s Walking Festival. 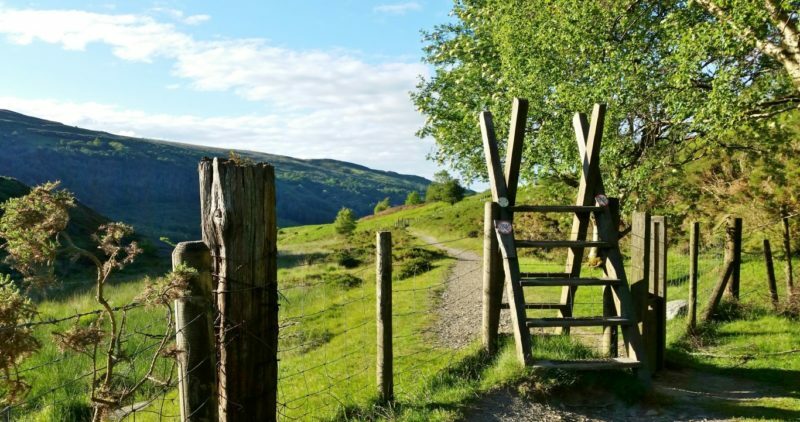 We also organize the newly revived Trefriw Mill Fell Race in conjunction with the Welsh Fell Runners Association, and manage and publicise the Trefriw Trails – a set of 8 walks in the Trefriw area. In 2017 we established a new 9-mile Legends Trail as part of the Year of Legends in Wales. 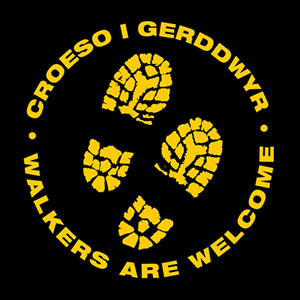 We remain grateful to all those walkers who generously support the Walking Festival, to walk leaders and others who are so willing to volunteer their services, and to all those other helpers and sponsors.